CHICAGO, Feb. 5, 2019 (Boeing PR) — Boeing [NYSE: BA] today announced a partnership with Aerion, a Reno, Nev.-based company pioneering next-generation supersonic aircraft. 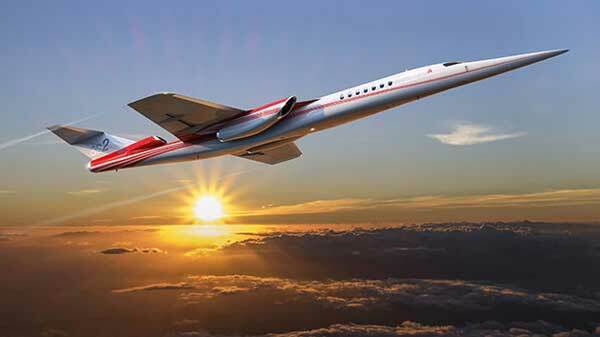 As part of the agreement, Boeing made a significant investment in Aerion to accelerate technology development and aircraft design, and unlock supersonic air travel for new markets. Terms of the deal were not disclosed. This rendering shows the Lockheed Martin future supersonic advanced concept featuring two engines under the wings and one on top of the fuselage (not visible in this image). 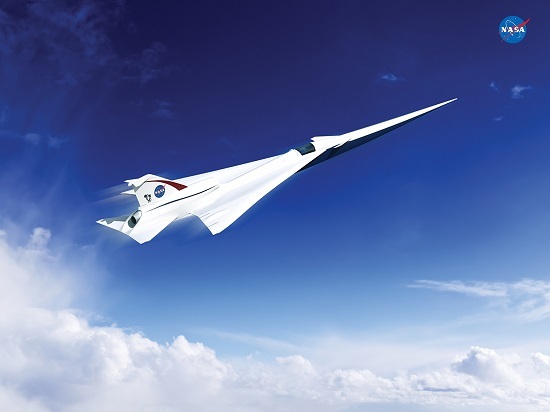 WASHINGTON, DC (NASA PR) — NASA has taken another step toward re-introducing supersonic flight with the award Tuesday of a contract for the design, building and testing of a supersonic aircraft that reduces a sonic boom to a gentle thump. Lockheed Martin Aeronautics Company of Palmdale, California, was selected for the Low-Boom Flight Demonstration contract, a cost-plus-incentive-fee contract valued at $247.5 million. Work under the contract began April 2 and runs through Dec. 31, 2021. 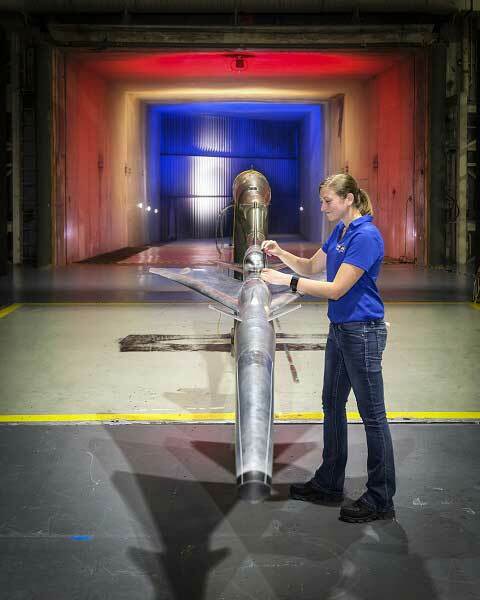 HAMPTON, Va. (NASA PR) — Samantha O’Flaherty, Test Engineer for Jacobs Technology Inc., finalizes the set-up of the Quiet Supersonic Technology (QueSST) Preliminary Design Model inside the 14- by- 22 Foot Subsonic Tunnel at NASA Langley Research Center. Over the next several weeks, engineers will conduct aerodynamic tests on the 15% scale model and the data collected from the wind tunnel test will be used to predict how the vehicle will perform and fly in low-speed flight. The QueSST Preliminary Design is the initial design stage of NASA’s planned Low-Boom Flight Demonstration experimental airplane, otherwise known as an X-plane. This future X-plane is one of a series of X-planes envisioned in NASA’s New Aviation Horizons initiative, which aims to reduce fuel use, emissions and noise through innovations in aircraft design that depart from the conventional tube-and-wing aircraft shape. Residents along Florida’s Space Coast will soon hear a familiar sound — sonic booms. But instead of announcing a spacecraft’s return from space, they may herald a new era in faster air travel. THIS NOTICE IS PROVIDED FOR INFORMATION PURPOSES ONLY. THIS OPPORTUNITY IS AVAILABLE ONLY TO LOCKHEED MARTIN CORPORATION, LOCKHEED MARTIN AERONAUTICS COMPANY, PALMDALE, CA. The Supersonics Project is aligned with the Aeronautics Research Mission Directorate (ARMD) principles of maintaining intellectual stewardship of aeronautical core competencies for the nation in the supersonic flight regime and of focusing research in areas that are appropriate to NASAs unique capabilities. 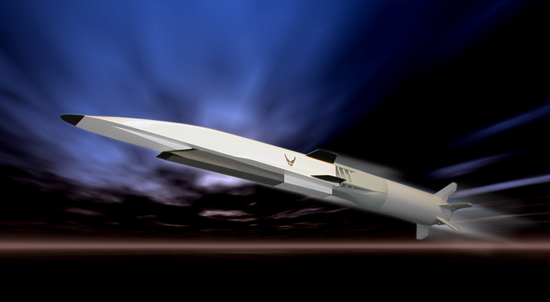 The Project supports the Fundamental Aeronautics Programs (FAP) strategy of developing systems level multidisciplinary capabilities for supersonic civilian and military applications. Charles Lauer – Vice President of Business Development, Rocketplane, Inc.